Debt seems to be a growing problem. That’s a concern. Time to set your position now. Seems more and more Aussies are struggling with their finances. That’s what the data are telling us. Consumer confidence is soft, and the latest ME Survey of Financial Comfort is pointing to tougher times ahead. It says incomes are getting squeezed, people are more and more worried about their debt, and retirement isn’t looking as cruisy as it used to look. The ME survey is an interesting one. It’s only young, but it goes directly to how people feel about their finances. And its how people feel about their finances that determines how they act. So if we look at ME’s overall Household Financial Comfort Index – a measure of households’ perceptions of their financial comfort – it dropped significantly by 4% to 5.37 out of 10 in the six months to June 2016. This result means about 90% of Australian households reported low-to-mid financial comfort, with only 10% reporting high comfort. If we’re the lucky country you wouldn’t know it from this result. Maybe the bottom 90% are being unnecessarily grim, but we do know that wealth gains since the GFC have gone overwhelmingly to the top 10%. So maybe there’s no surprises here. If you look at where financial stress is coming from, debt is one of the major concerns. This latest report reveals a marked fall in Aussie households’ confidence in their ‘ability to manage debt over the next six to 12 months’. The proportion of people reporting that they “Cannot meet my required minimum payments on my debt” has doubled from about 5% over the past few years to 10% as at June 2016. At the same time, the share of people reporting having a little headroom has fallen. 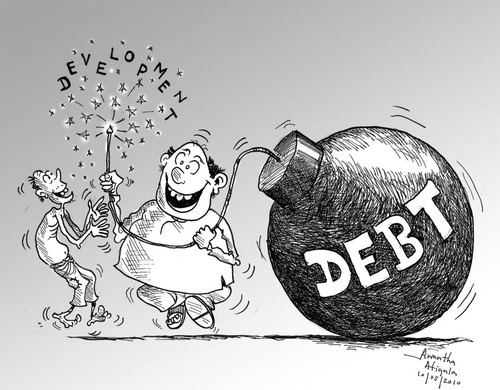 So debt is a growing issue. It makes me wonder how many of these people are feeling stressed because they have a negatively geared property bleeding them of cash. It’s the not the whole story, for sure, but I reckon it would be significant. So debt is going to be a major fault-line during the next down turn. (It always makes or breaks economies.) If there’s some sort of income shock, like some sort of crash overseas, then its debt that puts households in deep water. Its concerning though that we’re getting to the point were debt is becoming a drama, before the economic indicators have soured. Economic growth is solid, unemployment is low, inflation is non-existent. It makes you wonder what these charts would look like if Australia was actually under pressure. And one of the most tragic results was the sharp rise in people drawing down equity to “pay off debt” (up 4 points to 11%) or just ‘to make ends meet’ (also up 4 points to 10%). Equity is where you’re power to build a portfolio is. Equity comes from time in the market (or manufacturing it yourself! ), and it’s your best access point to OPM – other people’s money. Often when students come to me, this is their biggest asset – the equity in their own home. There are easy and safe strategies to turn this equity into a growing portfolio. So it makes me sad to hear that people are drawing on this power, not to get ahead, but to just keep their heads above water. It’s really a shame. I mean, it keeps them afloat now, but they’re eating their seed corn. Once the equity’s gone it’s gone. So this is my offer to you – and to everyone. If you find yourself getting to the point where you’re contemplating drawing down on your equity just to get by, take a deep breath and come and talk to us. There could be other options. Maybe you could use that equity to set yourself up with a cashflow positive property – a property that’s actually putting money in your pocket. And you often need to look at the complete picture. Maybe a negatively geared property is actually the problem, and if you weren’t feeding that hungry mouth it would be easier to get by. That might mean jettisoning that property, but there are also strategies for turning cashflow leeches into cashflow performers. Just don’t be too quick to give that equity away. It’s a powerful ally. And really, you’ve got to be thinking one or two years down the track here. There’s some dark clouds looming. Aussies are struggling and the sun is still shining overhead. There’s a window here to get yourself ready. Rather than hope that your equity will get you through the tough times, prepare yourself now. Build a performance portfolio that actually helps with the heavy lifting. And do it now before you’re forced to jump. A crisis is the worst time to be making a decision. There are always options is you know who to talk to. Just don’t leave it too late. Are you feeling a growing sense of financial discomfort?